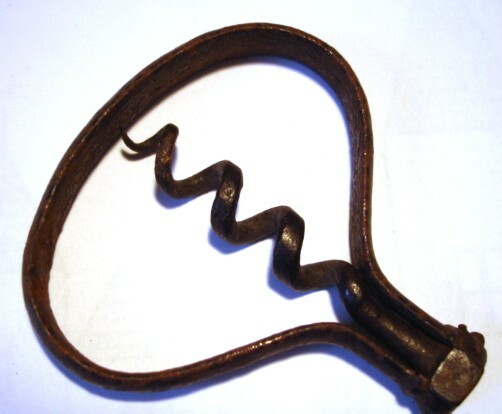 French Bow Corkscrew Circa 1800. A French 18th century folding bow in plain steel. The bow is made from a slightly curved flat band. The worm is flattened on the outside and has a lock to stop it being turned through more than 180 degrees. The hinge is riveted and the rivet shows signs of age. Length folded 2 inches. Condition: Is as found and uncleaned with some rust spots and pitting to the outer bow.